I spend a lot of time looking at photos. Mine, yours, strangers, leaders, followers…I look at them all. For as much as I love creating editorial/fashion/whateverlabelyouwanttoapply type images I also love seeing images that tell you a story. I suppose its the perfect mix for wedding photography with the latter being much more of a challenge to create. There’s no planning or sketching, there’s just waiting and hoping that what you think is about to happen will actually happen. Steph and I don’t usually high five over the creative portrait sessions but if we get a grab of life, a real moment then we’re high fivin’ with a knuckle bump kicker.Even in church. Ever since Marse and I had girls, without fail, when the father of the bride gives a speech at a wedding, I tear up. So this shot jumped out at me right away. I can (and will) show you Meaghan looking spectacular in her dress and I can show you Justin, G’d up from the feet up but I have a soft spot for this one. I just learned what Flip Cup was 10 minutes before this happened. Meaghan’s Dad, Bob, was the anchor for the unbeatable ‘Team 3’ flip cup champs. They trounced everyone for years. 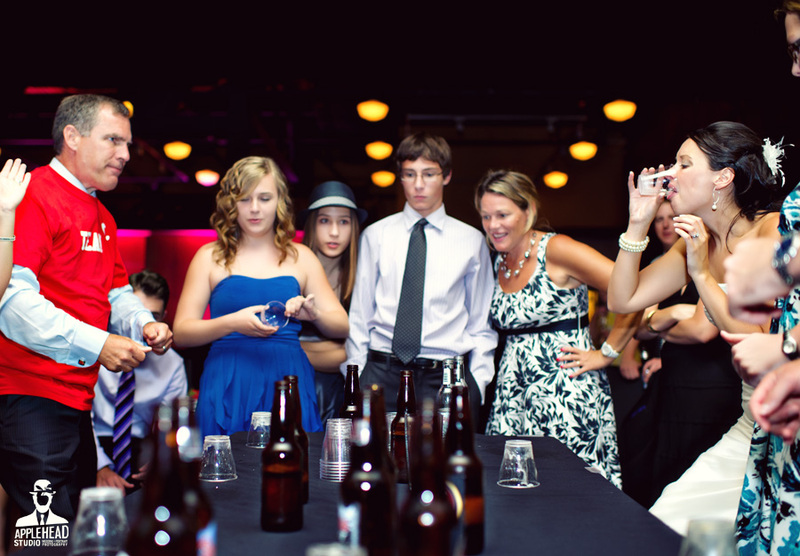 If you dont know, the objective is to drink the glass of beer, place the cup on the edge of the table and flip it so that it lands on the table, top down. It’s a relay and there are 4 per team and each team lines up one opposing sides of the table. Team 3 is unbeatable and they know it. Some might say they’re even a little cocky about it. Team shirts, team photos and tales of victory at the cottage. So near the end of the night Team 3 was piling up the victories and the empties and it was now Team 3 vs Meaghan’s team. Meaghan was the anchor so it was her against her Dad. Team 3 beat them handily but my favourite part is Bob’s reaction. Every other win had him three feet in the air, arms raised in a V but its bittersweet to beat your daughter at Flip Cup on her wedding day. I totally get that. I lose at hide and seek every time even though Lola hides in the middle of the kitchen floor. I hope I get to party w Ruby and Lola like Bob does with his kids. Moments like this are, without a doubt, one of my favourite parts of wedding photography. People like this are my favourite part. Jen + Rob. Wedding Stories. This photo is remarkable…I don’t know what else to say!!! Thank you!!! I’m breathless waiting to see more!! !